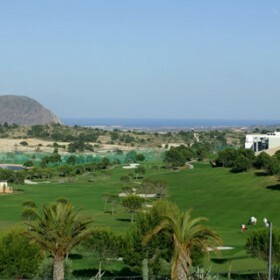 The Alenda Golf Club is situated very close to the Sierra de las Aguilas mountains and the sea, which provides a pleasant golf climate. It’s a gentle, undulating 18 hole course, with a nice variety of holes. 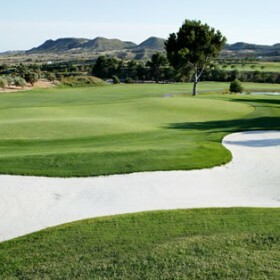 Alenda is an entertaining course for players of all levels, and you really need to use all of your clubs here. It’s quite a short round of golf, as all of the holes are linked, and it’s just a short walk from the greens to the tees. The first nine holes are of average length and favour the accurate player over the big hitter. 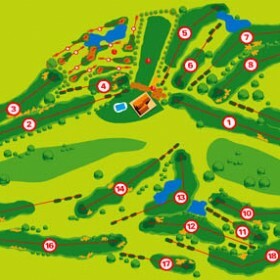 The holes are easy to play, and the fairways are quite wide, which helps on the tee shots. The second nine holes require more concentration, because this is the technical part of the course where precision is more important than distance. Be careful on the 16th and 18th hole especially; these two holes will define your score card result. Alenda’s slopey greens give the course a distinctive character, as they allow for a wide variety of flag positions. You will need to visualise the break very clearly when putting, and hit the ball with just the right amount of “oomph” if you want to hole out in good order. Covered driving range, putting green, chipping green, practice bunker. Restaurant, snack bar, clubhouse, parking, pro shop, buggy hire, club hire, trolley hire, club repair, changing rooms, golf classes, tennis, paddle tennis.